This review was commissioned by the artist Mike Collier and the AV Festival for their end of festival catalogue and can be downloaded as a PDF. When people gather together in a flat open space and they come there slowly on foot from two or three directions they carry with them in their arrival a congregational power. A field of walking. A force of walking. Like an ancient indaba in the desert to settle matters—you will come far if it is important. Imagine waiting at the well and seeing far away first emerge mesmeric dots, and then grains of black rice, and then curved talons, and then walking shapes: ah, people! The mystery of figures at a distance who you’re not quite sure you want to come closer, as in the later video works of Bill Viola and his characters half-hidden in the desiccated heat, all a-glimmer. The space we have come to in our own time and at our own pace is bounded on one side by faded industry and on the other a flowing river. But we are funnelled-in like sand, not water. There is a settled end to our procession, a ‘here we are’ or ‘this is it’ to our slowing and stopping and mingling that says, fine, we are arrived and ready, turn the hourglass over. 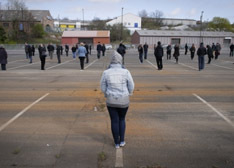 We have come together to take part in the artist Hamish Fulton’s ‘Slowalk’, the closing event of this year’s Newcastle-Gateshead AV Festival, in the car park of the old Spillers’ Wharf on Newcastle’s Quayside. It’s a typical Spring day, sun and cloud and the threat of showers. When the sun leans out from behind its shade it surprises me how hot it is already. But everyone, the 150 participants, the organisers, the watchers, the video- and photographers, are wrapped up against both blaze and bluster. Starting positions in this, the latest of Fulton’s walking pieces that he has been making, either on his own or with willing participants, since the late 1960s, were at either the end or intersection of the white lines of the car parking grid. We are all instructed to walk to the next intersection, and no further, in the following two hours. Likes beads on an abacus. The theme of the 2012 AV Festival has been ‘As Slow as Possible’. An artist of Fulton’s experience can afford to take it literally. From the end of one parking space to the centre line where it connects with the opposite car space is around ten feet. For those walking along the middle line, it’s around seven. I will walk a 43 percent greater distance than those others. Over the course of two hours, those three extra feet are a delicate gift. Half-an-hour in and I take a first look back over my shoulder at the line I’d been set to follow. I’d walked three, maybe four feet. “How far I’ve come!” I thought to myself (strictly no talking), genuinely surprised. It felt as if I hadn’t moved. Yet because of the extension of time, because of the dwindling into the distance of all other tasks, I was awed. We should take with us in all our making such markers by which we can judge more simply our actions, our achievements. It would be the slowest walk that I, and perhaps every other person taking part, will ever have to make. All, that is, except the artist himself. Fulton has been walking since the late 1960s. In 1973, having walked over 1,000 miles in 47 days from Duncansby Head (near John O’Groats) to Land’s End, Fulton made his decision to “only make art resulting from the experience of individual walks.” Some of his walks are over short distances, such as ‘Seven Paces’ in 2003, set into the Rhine Towpath. Some are more challenging: his 44-miles a day for seven days across Kent; his 10-kilometre backward blindfold walk. He has said: “If I do not walk, I cannot make a work of art.” He has also said of his walking-making: “Facts for the walker, fictions for the viewer.” So what facts? The obvious effect was the permission to take one’s time. But how to take it? How to bend and shape it? Like those I spoke to afterwards, many of us expected a meditative conga similar to that which Fulton curated in Kent and exhibited in Margate at the Turner Contemporary earlier in the year. Expectations had to be quickly adjusted. It would be the only speedy act in the two hours. I tried to meditate, but the walk was neither still enough nor at the pace of one’s heart for that. Others, as I looked around, were more successful. One man held still like a pressed flower. One woman with striking grey-white hair took a more cavalier approach—leaning slowly in one direction, before spinning on the spot with arms out to break the spell. Others experimented with ways of walking. One kicked a tiny stone along in front of her, and when it was over, picked it up and put it in her pocket like a lucky charm. One counted to three hundred before each step. Another, we gossiped after, had not moved at all in the whole two hours! And yet, when it was over, he was at his line’s end-point, a flat precipice at which no-one dared step over. How had he got there? Half-way through I was ahead of the other walkers along the parallel set of lines. I slowed down further. I closed my eyes and rested on one leg then the other before picking the foot up, feeling every inch lifted, and then down a few millimetres in front. Stretching my back out between each step. When I looked around again, most of my companions had overtaken me. It was near the end I noticed the artist himself only two or three positions away, smiling generously. In the lines around his eyes I knew he had hardly begun; hours, days, months left in his capacities. I saw on his face that he had set us a challenge, we participants, in this mass art event. To curate art, a challenging act, was for Fulton to trust us to walk our walk, so to speak. To trust us in following strict instructions, but that was only the ticket to ride. By the time it was over, if we had entered into the spirit, we would have discovered some idea about ourselves, whatever it was. In an interview earlier this year, Fulton said: “I like to introduce the notion of ideas into walking, expanding the idea of walking, instead of walking simply as a recreational pursuit.” For much of his recent walking, that idea has been ‘justice’ (for example, for Tibet). On Newcastle’s Quayside, the idea was, perhaps, something more apolitical, prosaic, but fundamental: that we do not simply pass through the artwork; the constitution of the self is not suspended while engaged with making art: the self is precipitated by the quality of the relation to the experience of making. As Fulton says, ‘no walk, no work.’ Or perhaps it was just: take your time. And then it was over. A gong rang to mark the end of the two hours: the walker opposite me jumped. For those facing the river, where the gong was held and hit, it did not come as a surprise. Those facing the other way had instead marked the passage of time by the Quayside hopper as it ran along the road every 15 minutes, interrupted by the local boys who BMX-ed by and weaved away on the half-pipes of fear (‘they’re freaking me out’) and aggression (‘you’re all weirdos!’). Like an ancient indaba in the desert to settle matters—you will come far if it is important. And then when it is over, you will leave. If the matters have been settled wisely, or if in fact you found no difference between you at all (none to speak of) then you will walk away with confidence, others at your back. You will not usually turn around. And you will realise, perhaps with a smile and a glance at your companions, that as much as the congregation was important, and that you drank fully from the well, and that to rest on the soft zafu cushions was a pleasure, you will know, deep within you, that the further you walk to reach such a place, the less you have to say.